In order to ease the daily activities in life, a growing number of sophisticated embedded systems is integrated into a users environment. People are in need to communicate with the machines embedded in the surroundings via interfaces which should be as natural as possible. A very natural way of interaction can be implemented via gestures. Gestures should be intuitive, easy to interpret and to learn. 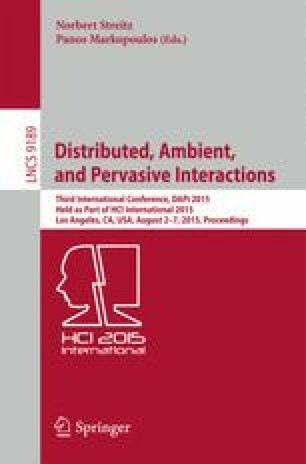 In this paper, we propose a method for in-the-air gesture recognition within smart environments. The algorithm used to determine the performed gesture is based on dynamic time warping. We apply 12 capacitive proximity sensors as sensing area to collect gestures. The hand positions within a gesture are converted into features which will be matched with dynamic time warping. The gesture carried out above the sensing area are interpreted in realtime. Gestures supported can be used to control various applications like entertainment systems or other home automation systems.